Globe launches a new calling service that allows international inbound calling from Korea to Philippines. This is to answer Koreans who considers the Philippines as their second home. 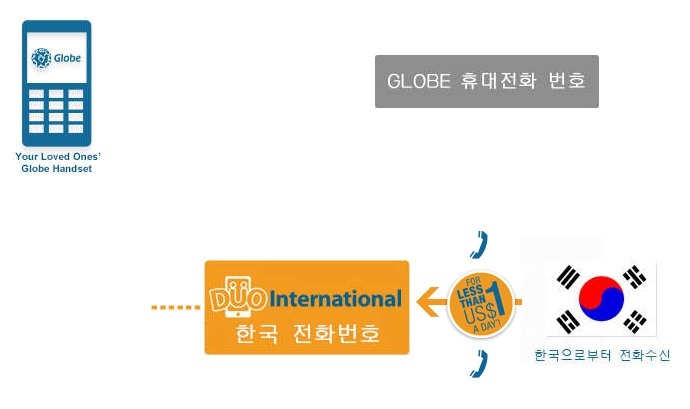 Globe Duo Korea allows a Globe or TM subscriber to purchase a Korean based telephone number to make a direct call to a Globe or TM number. With this service, there is no need to schedule or wait for incoming call ‘til you arrived at home and access the internet based calls. Your love ones from Korea can call anytime anywhere as they can directly call right to your mobile phone number. 30 days Duo Korea subscriptions – best for Korean students, businessmen and migrants who left their family and relatives on their hometown. Globe Telecom also partnered travel agency who handled tourist travels from Korea to Philippines and United Korean Community Association in the Philippines; this is to ensure travelers about this latest service offered. This service is made possible in partnership of Globe and INY Communications, who handles and provides clients affordable international calling services.